Saturday, October 15, 1911: Was so busy all day. Had to help Daddy pick corn and husked pop corn between loads. Both of these jobs aren’t finished yet either. Whew, it sounds like a lot of work. There weren’t combines (or even mechanical corn pickers) a hundred years ago. Horses would have been used and much of the labor would have been by hand. This entry made me curious about how crop production and yields have changed over the last 100 years. Corn production has mushroomed. In 1911, approximately 2,475 million bushels of corn were produced in the US. In 2011, about 12,447 million bushels were produced. So few soybeans were produced in 1911 that the U.S. Department of Agriculture did not even track it. In 1931, 17 million bushels of soybeans were produced in the U.S. –and by 2011 approximately 3,329 million bushels were produced. Barley and oats production decreased substantially between 1911 and 2011—probably due at least in part to the reduced number of horses that needed to be fed in the US. Wheat production increased a little over the years. Crop yields increased significantly for all the major cops between 1911 and 2011. Corn yields increased the most. For example, in 1911, about 24 bushels per acre were produced. This increased to approximately 148 bushels per acre in 2011. Yields increased substantially between the 1930’s and 1950’s due to the widespread shift from open pollinated corn to hybrid corn. The increased use of commercial fertilizers and pesticides in the later part of the last century also increased yields. 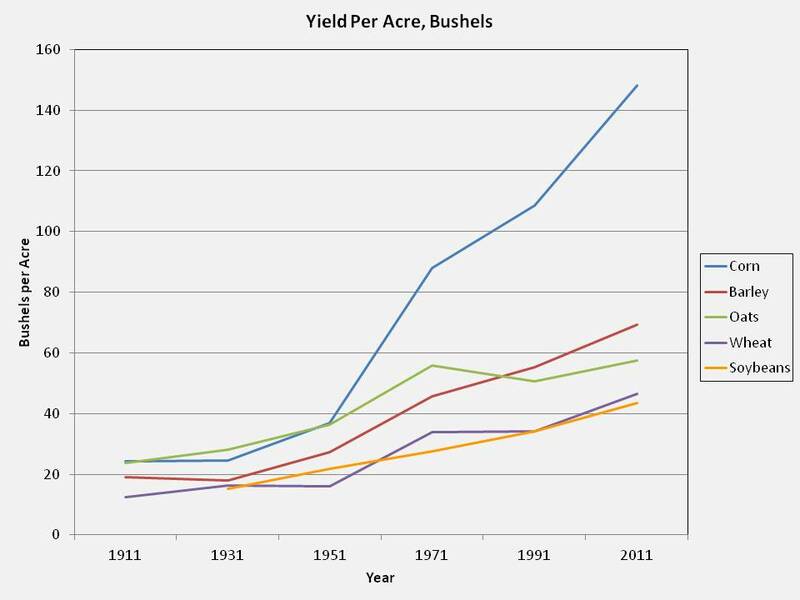 In recent years the use of genetically modified seed has led to major yield increases. 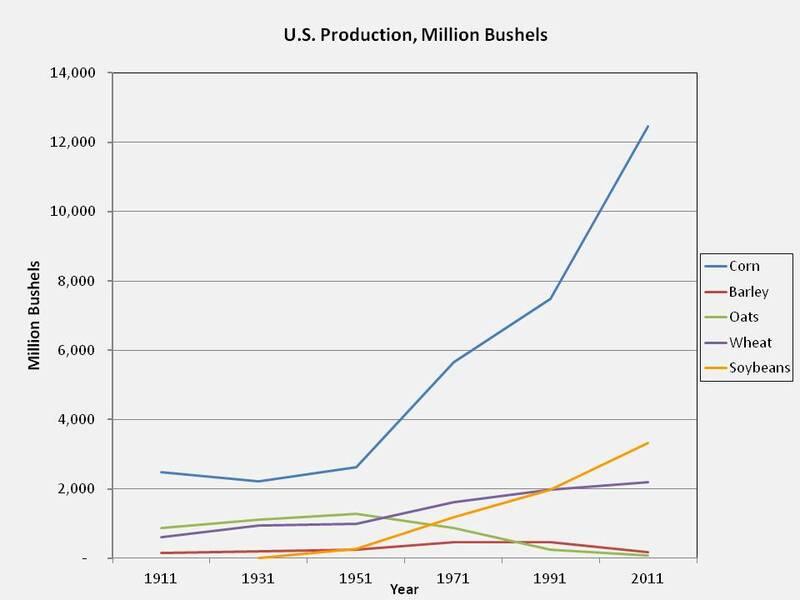 Another factor that has increased the average yield per acre over the past 100 years, is that some of the less productive land in the US has been taken out of production. Data Source: US Department of Agriculture. For some crops 2011 data are not yet available. If not available, 2010 data were used to construct the figures. Posted on October 14, 2011 July 8, 2012 by SherylPosted in Farming and Gardening, StatisticsTagged 100 years ago, diary. Next Next post: How Many Verses Did She Memorize This Week? Note that corn crops have increased tremendously in the past couple of decades due to the use of corn in so many different foods (corn syrup and high fructose corn syrup are the first that come to mind). Not much of this is the corn-on-the-cob that many of us enjoy eating in the summer months. Corn sure is used for a lot more things today than it once was. Interesting post. I also couldn’t help but think of her hands. Dealing with corn husk all day would make some cuts and callouses, I think. You’ve got to admire the youth in those times. You’re right–I bet husking corn would really make a mess of her hands. Next time I talk with my dad I’m going to have to ask him about what it was like to husk corn. Very interesting! What did you find out from talking with your dad? My dad says that they wore gloves and used a husking peg. A husking peg was a small nail-like piece of metal that was attached to a strap that fit across a person’s hand. The person would use the peg to start pulling the outer husk away from the corn ear. Dad also said that it was really important to have a very calm team of horses pulling the wagon that the husked corn was thrown into. The team needed to stand still until the people completed husking the corn in one section of the row; then upon command, move forward a short distance and then stand still again. For more on husking corn–including the link to a great video on it– see my October 28, 2011 post on husking corn. Can you provide the Web address where you found the USDA information about crop yields? I have looked at USDA but have not been able to find it. Thanks! They are all found on the US Department of Agriculture site.